1. From the Ascend desktop, select View > Locations. Or select the Database Explorer icon > Locations. 2. 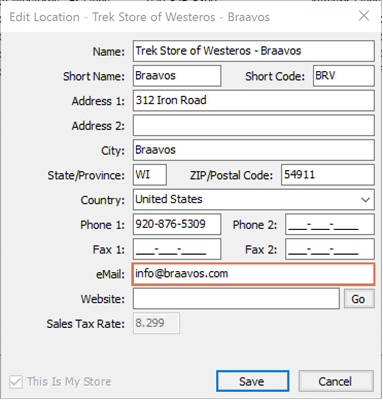 A list of locations displays in the right pane. Highlight the required location. 3. Click the Edit icon to open the Edit Location window. 4. Enter the email address for the store in the eMail field. 1. From the Ascend desktop, click Options. 2. The Options window opens. Click Services on the left. 3. In the Workstation Email Address field, enter the email address for the workstation. 4. Click Apply or OK. The workstation(s) default email address must be specified before an email signature can be configured. 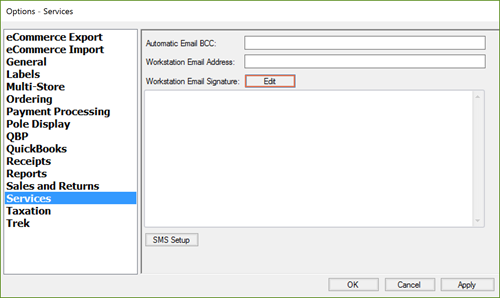 Email signatures must be configured separately on each workstation. 3. 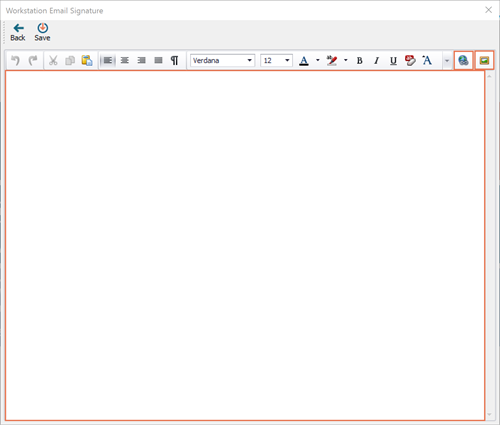 Click the Edit icon next to Workstation Email Signature. The Workstation Email Signature window opens. 4. Create your system email signature. Enter and format text, insert a store logo or other images, and add hyperlinks, if needed. Attachment file size(s) must be less than 1 MB. 6. Click OK or Apply in Options to go back to the Ascend desktop.